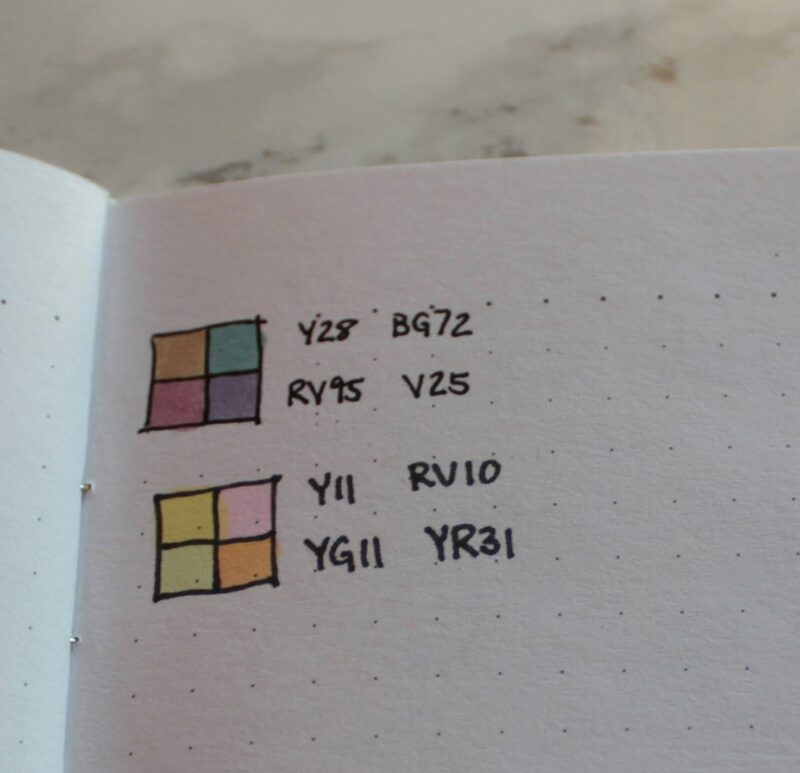 Toward the end of my first year in graduate school, the year I discovered I had a knack for doodle notes and elaborate bullet journal pages, I found myself often repeating the same few layouts, techniques, and lettering styles in my notes. As I noticed this tendency to repeat, I suspected the habit was forming around my own growing expectation for my notes to turn out great consistently. In setting this expectation for myself, I’d come to rely more and more on using fonts, layouts, and styles I knew worked instead of trying new styles. My remedy was two fold: 1. to relax and remind myself to bless goofed-up notes as part of the learning process, and 2. To keep a notebook of experimentation, and to keep that notebook handy as a kind of lettering recipe-book. My little experiment book reminds me of letters and doodles I’ve practiced but might not recall on the fly. I use a tiny notebook they sometimes hand out at my school that matches the dimensions of the Moleskin Extra-Small. I like this size a lot because it slips into the back of my pen case easily. It’s been helpful just to have a sort of glossary of my own skills handy. When I’m taking notes in class my focus is primarily on recording information quickly rather than trying new things and getting extra creative, so having practiced a style once or twice previously gives me more confidence to approach different layouts when taking “live” notes. I use this notebook as a space to practice form without function. Free from needing to illustrate and idea or concept, it’s just free space to practice on small, portable pages all the lettering, shading, doodling, and headlining methods in my repertoire. 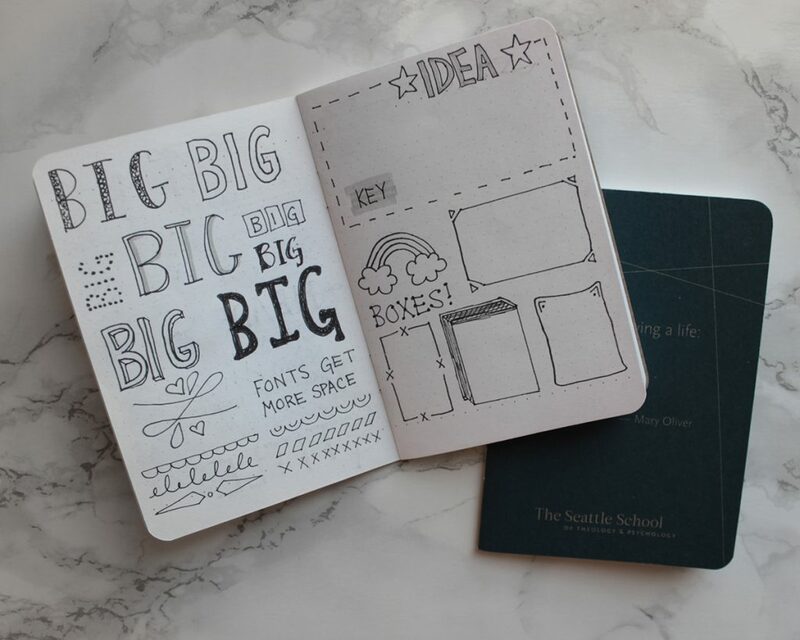 Grab a Tiny Notebook and a pen. 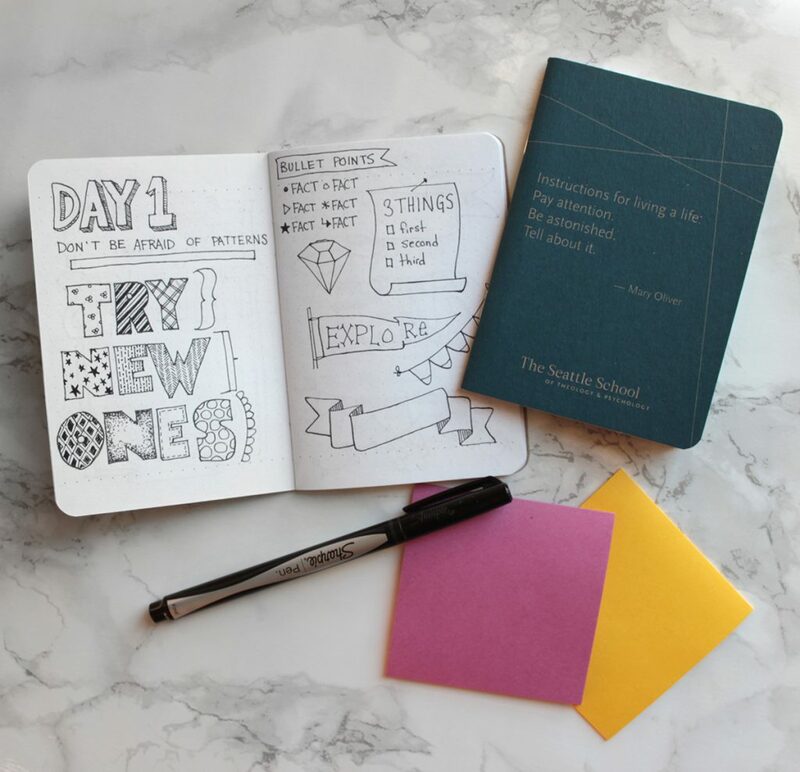 Use the next pages in your notebook to challenge yourself to expand your lettering and doodle skills. For me, this is a fun way to de-stress- 10-20 minutes after dinner here and there, getting to try new techniques without worrying about it permanently being in my journal. For inspiration/help learning new doodles and fonts, you can view my tutorials, or check out studypetals on tumblr, who’s pages of hand lettered font samples and doodles have been really helpful for me. this … is …. FANTASTIC!!! !